For these adventurous scientists, eclipses open a rare window to study the crown of ultrahot material that surrounds the sun. 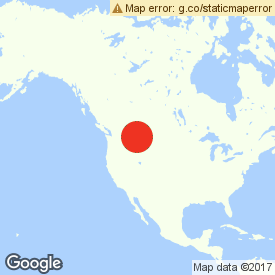 BuzzFeed News joined them near Mackay, Idaho. “Looking good, boys!” It’s about 20 minutes before totality, and Steven Fearn is elated. We’re in a mountain valley in central Idaho. There isn’t cloud in the sky, and the haze from wildfires is lighter than we’d feared. Fearn, a physical sciences technician from Aberystwyth University in Wales, knows that nothing can ruin the observations, short of equipment failure. The countdown continues. “One minute!” shouts our timekeeper, Jay Hale, a retired mechanical engineer from Arkansas. “30 seconds to total … 20 seconds to total.” By now it’s noticeably cold, and we’re in twilight. We stare at a fast-disappearing sliver of the sun through our protective glasses. Behind us, the moon’s shadow is racing up the valley at almost 1,950 miles per hour. Then everything goes dark. Through my eclipse glasses, I can see nothing. I take them off, and I’m blown away. The sun has been replaced by a black disc. Surrounding it is a bright diamond ring, dotted with a few flecks of red. And from that ring extends a wispy white halo, with denser streamers reaching out from the sun’s equator, at roughly 2 and 8 o’clock. Radovan Mrllak of the Úpice Observatory in the Czech Republic and Dan Mibbelink of Colorado set up some of the equipment. This was the scene that played out at Idaho State University’s Lost River Field Station, overlooked by Mount Borah, the state’s highest peak at more than 12,500 feet, at 11:30 a.m. local time today. Mackay — the nearest settlement, which has fewer than 500 residents — is more than 20 miles away. I’d driven on gravel roads to join a contingent of the “Solar Wind Sherpas,” an international team of scientists led by Shadia Habbal, a physicist at the University of Hawaii in Honolulu. They call themselves sherpas — for the hardy Nepalese people who help carry mountaineers’ gear in the Himalayas — because they haul their portable equipment into the field. Their scientific quest is to understand the formation of the solar wind of charged particles that streams out from the sun at speeds of about a million miles per hour. And the team in Mackay had just 2 minutes and 15 seconds to carry out a long-anticipated experiment. “Two years of planning. Two months of prep. Two weeks here. Two minutes flat out,” Fearn told BuzzFeed News on Saturday afternoon, during a break from testing the equipment. Today’s total solar eclipse gave the sherpas a fleeting opportunity to see the corona, a halo of ultrahot material that surrounds the sun and is usually obscured by its glare. By observing the corona, the scientists hope to better understand how the solar wind is accelerated to such astonishing speeds. Just one glitch, and all would be lost, so the pressure was on. “We have to get it right,” Fearn said on Saturday, warning me that during those two crucial minutes, I’d need to keep well clear of the tent housing the equipment, because he and Joe Hutton, a research assistant at Aberystwyth, would need space to swing into action if anything went wrong. The scientists relied on a custom-built spectrometer — a black box about 2 feet square and 6 inches deep with a telephoto camera lens at the front. Inside, a narrow slit ensures that the device looks at just a narrow vertical slice of the image at any one time. Then mirrors and lenses split the light into three bands, each with a different range of wavelengths. This elaborate arrangement is designed to make a temperature map of the corona by looking for the light emitted by hot iron. Atoms of iron have 26 electrons, but at the scorchingly high temperatures in the corona, these get torn away, releasing light of a distinctive wavelength for each electron. The three wavelength bands captured by the cameras inside the spectrometer — corresponding to red, green, and blue light — include three of these key “emission lines.” By looking at the relative intensity of each of the three lines, the sherpas can work out the temperature of the material in that part of the corona. For everything to work as planned, the spectrograph is first manually pointed at the sun, guided by a solar telescope attached to the front of the box. An automatic tracker on the tripod then takes over, following the sun as it moves across the sky. That continues until the moment the moon completely blocks the sun. Then the tracker is switched off, with the slit looking at the left side of the sun, right at its surface. Over the next couple of minutes, as the sun and moon continue to drift together across the sky, the slit stays put, sweeping out from the sun’s surface across the corona. Saturday’s test went well. The automated tracker was working. So, too, was the spectrometer, revealing clear emission lines on two of three laptops displaying the data recorded by cameras inside the device. One still needed some tweaking to get its sensitivity just right to show the emission lines, but Hutton and Fearn were confident that would be an easy fix. Later that afternoon, disaster almost struck. But later that afternoon, disaster almost struck. A gale suddenly ripped through the valley, and a silvery tarp that had been fastened over the tent to protect the equipment inside from the sun’s heat started to tear. We ran to secure the tarp and fixed it with tape. Just feet away, a sunscreen tent that hadn’t been so well secured lay mangled on the ground. If that was the tent containing the sherpas’ sensitive equipment, two years of planning would have come to nothing. Even if the equipment behaved itself, there was no guarantee that nature would oblige with a perfect view. Haze from a wildfire, or even light cloud, could ruin the observations, Hutton said. A white-light image of the solar corona during totality. Since October 1995, when Shadia Habbal made her first eclipse expedition to Rajasthan in India, the sherpas have chased eclipses across the globe. Today’s eclipse, traversing the US from coast to coast, was their fifteenth and biggest outing to date. More than a week beforehand, the sherpas gathered in Boulder, Colorado, before fanning out to five sites in the zone of totality across the western US — from Mitchell, Oregon, where Habbal was based today, to Alliance, Nebraska. Each eclipse has brought adventure as well as scientific opportunities. In 2001, the sherpas pitched their tents near a river in Zambia, not realizing that their campsite was surrounded by hippos — among the most aggressive and dangerous animals in Africa. Five years later in Libya, Habbal’s plans to cross the Sahara in SUVs with Tuareg tribespeople to a secluded desert campsite near the border with Chad were transformed by a thawing of relations between dictator Muammar al-Qaddafi and the US. The Libyan army got involved, providing helicopters and an elaborate camp with satellite internet. Today, both Libya and Syria have been torn apart. “Syria is totally destroyed. That whole area — gorgeous, gorgeous desert and artifacts, and the history. All that is lost,” Habbal said. Although each eclipse has been a memorable experience, the science has only come together to Habbal’s satisfaction during the past two or three, with improvements to the spectrometer design. On recent expeditions, the sherpas have also been joined by Miloslav Druckmüller, a mathematician at the Brno University of Technology in the Czech Republic, who is a wizard at photographic image processing. 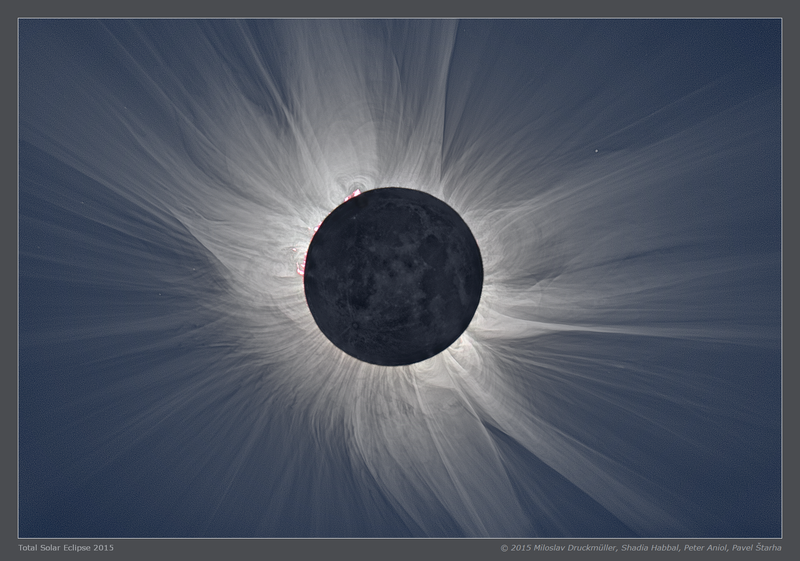 His stunningly detailed images of the corona help the scientists interpret the spectrometer data. Shadia Habbal speaks with the media moments after the eclipse over Svalbard. In 2015, during an eclipse on the Norwegian island of Svalbard, deep inside the Arctic Circle, the spectrometer’s emission lines provided a new discovery. Within the corona were expanding bubbles streaming away from the earthbound observers. These had been seen before, but their temperature had never previously been mapped. The bubbles consisted of a shroud as hot as the surrounding corona, at about a million degrees, surrounding cooler material, at between 10,000 and 100,000 degrees. The researchers had detected material from a massive solar eruption — a coronal mass ejection, or CME — moving away from them at speeds up to 1,500 kilometers per second, or more than 3.3 million miles per hour. They were able to measure its speed thanks to a phenomenon called the Doppler shift, which subtly shifts the wavelengths of the emitted light depending on how fast it’s moving toward or from the observer. Rather than coming directly from the sun’s surface, CMEs are thought to erupt from “prominences,” vast arcs of material looping out from the sun, flowing along tangled magnetic field lines. When a prominence becomes unstable, it burps up to a billion tons of material out into space in a CME. CMEs happen at least once a day. Particularly powerful ones cause dense patches in the solar wind that, upon reaching the Earth, can damage satellites and even disrupt the electric grid. But there are still questions to answer. One is why the cooler material that the sherpas observed isn’t quickly heated by the surrounding corona. And scientists still don’t fully understand the forces that accelerate the bubbles of material from a CME to such incredible speeds. Each eclipse provides another opportunity to probe these mysteries. Steven Fearn of Aberystwyth University in Wales and Zhenghua Huang of Shandong University in China prepare an instrument called a magnetometer to measure changes in Earth's magnetic field. When totality was over, I didn’t need to ask whether things had gone well. The scientists were applauding. The equipment had behaved perfectly. Visibility was perfect.